Continuing the series on making a matched telescope worm wheel and gear set on a mini-lathe, the next stage is to face one side of the worm wheel blank on the mini-lathe, drill out the middle, and re mount directly on the mini-lathe spindle ready for cutting the worm wheel blank to the correct size. With the worm wheel mounted on the mini-lathe spindle, you need to use your dial indicator to center the wheel - use a copper hammer to center the wheel - you only have to get it to within a few hundredths of a inch - accuracy is not important here - we just do not want an off center wobble when facing. First drill out the middle of the worm wheel blank. This is not vital, but makes handling the part much easier, and you're going to have to do it sooner or later. Use a center drill followed by increasing sizes of drill and finish with you largest. You need to bear in mind the final size of your shaft at this point. I am going to use a 30mm shaft - so the final inner diameter wil have to be bored out - so at this stage I drill out to 18mm, which is the largest drill bit I have on my mini-lathe. Now take a facing cut across the front of the worm wheel blank to tidy up the face. The radius of the worm wheel blank is slightly larger than the travel on the slide of the mini-lathe, so do the best you can - and bear in mind some of it will be removed when you bore out the shaft access later. To aid my tired arms I attach a power drill with a screwdriver gear to the cross slide and use the electric power to move the slide back and forward whilst taking the facing cut. 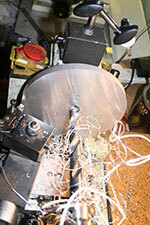 Make sure the studs holding the wheel to the spindle do not interfer with the cut. This is the only facing cut you will make on this surface, so it pays to do a neat and tidy job for the sake of later apperance, but it doesn't effect the operation of the part. Next, we remove the worm wheel from the lathe and turn it over. 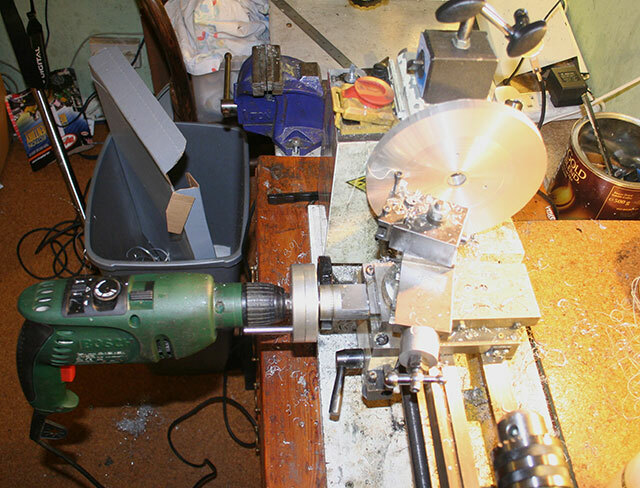 Because my chosen shaft (30mm) is larger than the spindle bore of the mini-lathe (20mm) I have to insert some spacers between the face of the worm wheel and the spindle, to raise the wheel slighly so that I do not cut into the spindle itself when boring the shaft hole. I use a couple of bits of HSS as they are ground to a fairly good tolerence. The blob of blu-tak is just to hold them in place whilst I re-mount the worm wheel blank the other way around with the new faced surface against the spindle and the unfinished surface ready for cutting. Now I get setup with a boring bar and start to enlarge the shaft hole in the middle of the worm wheel, taking care not to cut into the spindle itself. There are three different cuts we now need to make, and each needs to be very precise and concentric with each other. Boring the shaft hole in the middle to the correct diameter. Some of these cuts involve removing a fair bit of metal, and this always runs a risk of upsetting the mounting of the part in the lathe, and ruining the concentricity of the cuts. It is vitally important that these three elements are made concentric, you must not remove the part from the lathe until all three cuts are correct. To eliminate the risk of the part shifting, we need to make each of the three cuts leaving a small amount of metal to be removed - finally we go aroudn the three cuts again making very light finishing cuts. First I need to make the cut for my shaft hole. 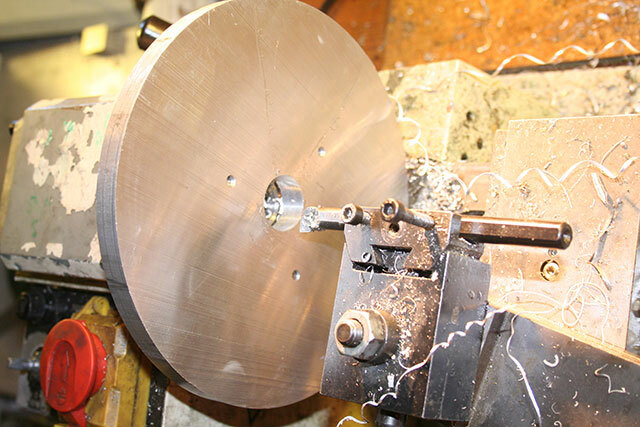 My shaft is 30mm diameter, so I am going to bore out the center of the worm wheel blank to about 29mm, leaving a bit of metal for the subsequent finishing cut after I have faced the part and turned the outer diameter. 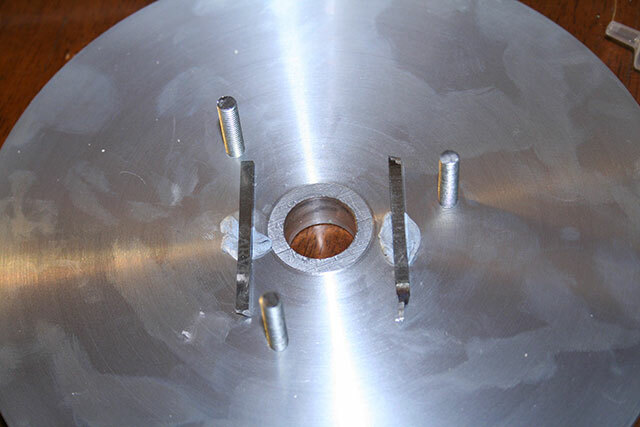 Then face the front, as before, and then clean up the outer diameter so it is round, but pay attention to the next section on the worm wheel blank outer diameter before taking off any more metal.